President Kim Dae-Jung during a pro democratic rally/protest. Kim Dae-Jung was born in 1925 on a small island off the southwestern coast of South Korea. After graduating high school in 1943, Kim decided to enter politics and help move South Korea in a more democratic direction. Kim was initially successful due to Syngman Rhee’s oppressive presidency, but was finally elected to the National Assembly in 1961. Unfortunately, in 1961, Park Chung-Hee dissolved the assembly, and this marked the first instance of Kim’s resistance to Park. Kim’s political career took another positive turn when he won a seat in the house in 1963 and 1967, and subsequently becoming a leader in the party opposed to Park’s policies. 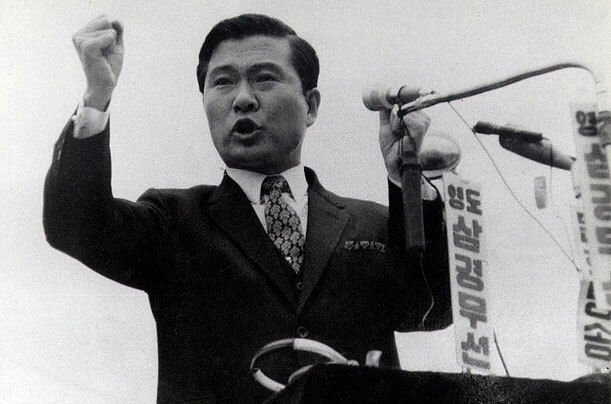 Kim contested Park’s much protested regime and ran against him in 1971. Although he was unsuccessful, he won an unsurpassed record of the popular vote in his home province. After coming to power Park Chung-Hee dissolved the assembly and Kim’s Democratic Party vehemently opposed the action in Korea and Japan. Park’s regime took notice and abducted him from a Tokyo Hotel in 1973. He was later put under house arrest and in 1976 arrested a second time for instigating pro-democratic demonstrations. Much to Park’s anger, Kim was dedicated to South Korean democratic institutions. After the assassination of Park Chung-Hee in 1979, Kim had his civil rights restored, although briefly. Within a few months a second military regime took power and sentenced Kim to death for highly inflated charges of treason. This was later altered and he was exiled to the U.S. Kim later returned to South Korea in 1985 and was put under house arrest until 1987, when his legal and practical rights were fully restored. Finally having the legal power to do so, Kim Dae-Jung ran in the Presidential elections in 1987, but was handedly defeated by Roh Tae-Woo. Disheartened by his continued political challenges, Kim stepped back from South Korea’s political arena. However in 1995, the Asian financial crisis was decimating the Korean economy, creating a constructive reentrance for Kim. In 1997, Kim ran against the incumbent leadership and easily defeated the country’s fragile leadership. After many failings and vehement opposition, Kim Dae-Jung was sworn into office in 1998. He swiftly dealt with South Korea’s economic crisis by implementing economic reforms and receiving assistance from the International Monetary Fund. His reforms and larger administration instilled transparency and democratic processes where there weren’t any. Kim is largely credited with helping revitalize the South Korean economy during a critical period. Kim Dae-Jung was one of the few leaders to successfully negotiate with North Korea and its despotic regime. Under his “Sunshine Policy”, ties and economic assistance to North Korea were increased and marked by a meeting with Kim Jong-il to legitimize the agreement. Kim was recognized internationally with a Nobel Peace Prize in 2000 for attempting to reignite the previous tenuous relationship between North and South Korea. Fully committed to peaceful democratic transition, Kim stepped down from power after his term was over in 2003. Kim’s legacy has allowed South Korea practical democratic institutions and created a national platform for the decades long agitation for liberalization.